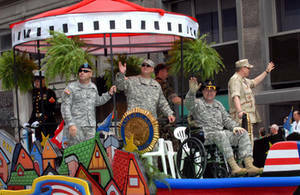 Description: In this free picture, men representing all branches of the U.S. Armed Forces are on a brightly colored float in the Memorial Day Parade. The photo was taken during the 2007 parade in Washington D.C. The image is from the Department of Defense photo bank.